Gravity Forms merge tags and conditional shortcodes are useful PDF-building tools, but there are drawbacks. For instance, you cannot create nested conditionals or do any post-processing to the entry data – you aren’t able to determine the age of someone by their date of birth, or convert a field to upper case. To achieve this behaviour we need to utilise PHP and the $form_data associative array – a formatted version of the $entry object. 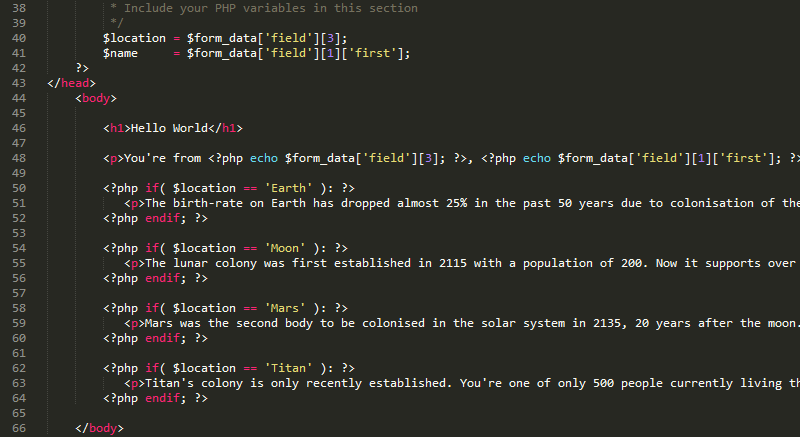 First, we’re going to convert the template we did in the Part 2 exercise from merge tags/conditional shortcodes to PHP. Then we’ll look at the two post-processing use-cases we discussed in the introduction. Finally, we’ll take a closer look at the $form_data array. The $form_data array is grouped into a number of different sub-arrays, but the most common is $form_data['field']. As the name suggests, it contains the field data for most Gravity Form field – add-ons that add new fields are stored in separate sub-arrays. When doing conditionals with the $form_data array, if your string comparison contains any of the following characters <, >, ", ' or & you’ll need to use the WordPress function esc_html() to get the desired result. Download the completed Hello World PDF template for Part 3. With the full power of PHP at your fingertips post-processing Gravity Form data becomes easy. Case in point, it’s relatively simple to determine the age of someone using their date of birth. Let’s go back to the Hello World sample form and add a date field. For simplicities sake, name it Date of Birth and change the Date Format to dd-mm-yyyy then save your form (the date format is important to prevent ambiguity when using PHP’s strtotime() function). Finally, submit a new entry and enter a date of birth. Another example is converting case. It’s simple to convert entry data to upper case, lower case or sentence case. Just run the field through a PHP function like mb_strtoupper() or strtoupper() (we recommend using the multibyte PHP functions where possible). The $form_data array is used to access the Gravity Form entry information, but unlike merge tags there’s no selector to show you what’s actually in the array. That’s why we’ve added a data URL parameter which shows you the complete contents of the $form_data array. [form_description] => Gravity PDF tutorial form used in our development documentation. As we mentioned earlier, our main sub-key is $form_data['field'], but there are other important details like the submission date $form_data['date_created'] and the entry owner’s user ID $form_data['misc']['created_by']. Each Gravity Form is unique and will create a different $form_data array. Gravity Form Add-Ons like Survey and Signature also add their own unique sub-keys in the array. You will also notice in our $form_data['field'] array there are three different references (array keys) for the same field. The keys without any ID are present for legacy reasons, while keys with the ID-and-field-combination make it easier to distinguish what field you are trying to reference. With that said, we recommend accessing the field data using the ID in your templates. The $form_data variable is an associative array, so more experienced PHP developers should have no problem accessing the information they need. However large forms can make this array intimidating for first time template builders. Below are examples for how to access the most common Gravity Form fields. The Custom Field can be configured to any field type in the Standard or Advanced fields sections. Refer to that particular field for output details.